To be a good Pokemon trainer, you must understand Pokemon types. Every Pokemon has a type, types their strong against, and types their weak against. This page, the Battle Chart, will show you how weak or how strong a specific Pokemon type is against other types. 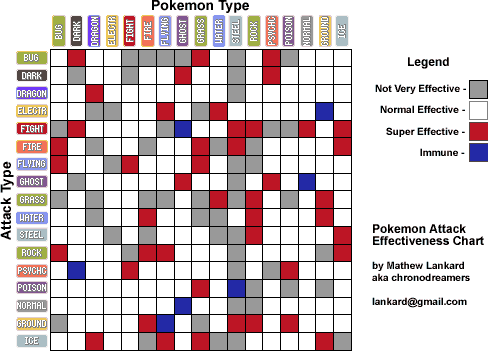 This chart requires a good amount of study, and afterwards, you'll know your Pokemon types and be a better Pokemon trainer!